Eilat is known for nature, zoos & aquariums, adventure, shopping, and beaches. Your plan includes some of its best attractions: admire nature's wide array of creatures at Underwater Observatory Marine Park, explore the gorgeous colors at Dolphin Reef, see some colorful creatures with a scuba or snorkeling tour, and explore the wealth of natural beauty at Timna Park. For traveler tips, where to stay, maps, and tourist information, go to the Eilat online vacation builder . Tel Aviv to Eilat is an approximately 1-hour flight. You can also drive; or do a combination of train and bus. Traveling from Tel Aviv in October, you will find days in Eilat are somewhat warmer (39°C), and nights are about the same (25°C). Wrap up your sightseeing on the 18th (Thu) to allow time to travel to Tiberias. On the shores of Lake Kinneret, a vacation in Tiberias offers plenty of water sports and biblical walks. Kick off your visit on the 19th (Fri): make a trip to Magdala, pause for some serene contemplation at Church of Mount of Beatitudes, contemplate the long history of Mount of Beatitudes, then take in the dramatic natural features at Tabgha, then explore the activities along Sea of Galilee, and finally contemplate the long history of Tiberias. For maps, traveler tips, ratings, and other tourist information, read Tiberias road trip planner. You can do a combination of flight and bus from Eilat to Tiberias in 4 hours. Alternatively, you can do a combination of flight, train, and bus; or take a bus. Traveling from Eilat in October, you will find days in Tiberias are slightly colder (32°C), and nights are about the same (23°C). Finish your sightseeing early on the 19th (Fri) so you can take a bus to Jerusalem. Step out of Jerusalem to go to Masada and see Masada National Park, which is approximately 1h 05 min away. On the 23rd (Tue), spend a fun day on foot with Walking tours. 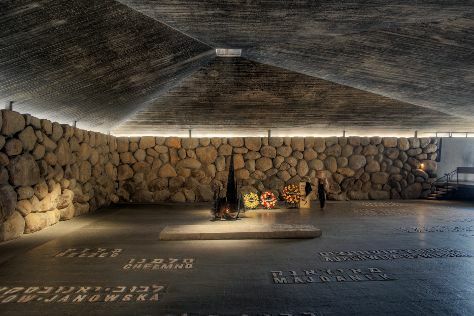 There's lots more to do: take an in-depth tour of Yad Vashem - The World Holocaust Remembrance Center, contemplate the long history of The Garden Tomb, delve into the distant past at Western Wall, and wander the streets of Old City of Jerusalem. For maps, traveler tips, photos, and more tourist information, refer to the Jerusalem itinerary planner . Traveling by bus from Tiberias to Jerusalem takes 2.5 hours. In October in Jerusalem, expect temperatures between 34°C during the day and 21°C at night. Finish your sightseeing early on the 23rd (Tue) so you can take a bus back home.